There’s a great video on TED that I had to watch several times before it started to sink in. It’s about making hard choices, for example, a decision about a career path. Ruth Chang argues that sometimes it’s not possible to make a choice based on logic alone, rather, one must look inside oneself to make make such a decision. What are your values? What do you want to be? A black sock wearing, donut loving, urban dwelling artist? Or a brown sock wearing, country loving, vegan accountant? 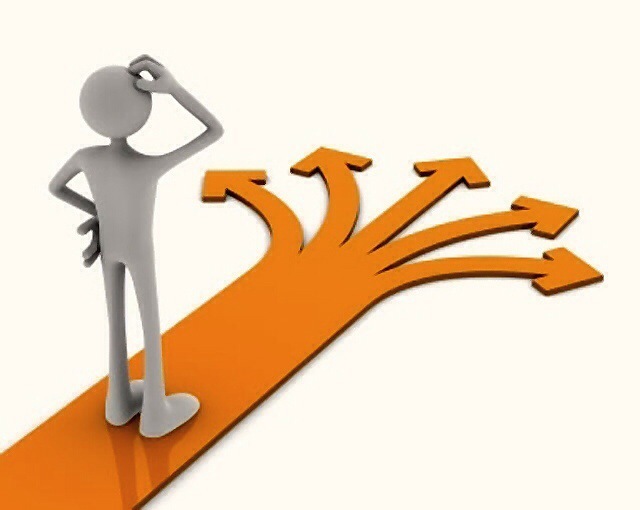 How do you know when you’re making the right decision when confronted by a difficult choice? You can’t know, because there is no right or wrong. However, you can feel it. Picture yourself in a future state. Does your heart rate increase, not from worry or stress, but from excitement about what could be? If it does, you’re on the right track. Now bring yourself back to reality. Bring yourself back to today. Commit to one simple choice that you can make today that will help you become that person you want to become. Go for a bike ride; sign up for a course; join a club; read a book; plan a vacation; eat healthy; call a friend; hug someone; wear brown socks. Do something, but commit to it. Achieving your goals doesn’t happen over night. It comes from having a vision and then making choices every day that help you to achieve that vision. Some choices will be right, some not so much, but keep moving forward and don’t look back. What choice will you make today that will help you to achieve your vision?